At the root, healthcare is a pocketbook issue. An increasing share of insured Americans report difficulty affording healthcare. Deductibles are rising – growing more than four times faster than wages – and causing worry, especially over unexpected medical bills that ripple families and their budgets. 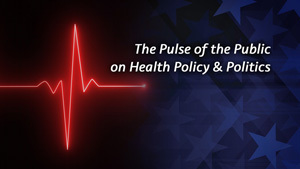 Drew Altman, President and CEO of the Henry J. Kaiser Family Foundation, provides an analysis of the public’s priorities and opinions in healthcare as the new congress takes shape and the 2020 presidential campaign begins. Using polling data, he shows that in the midterms, healthcare was a top issue for Democrats and Independents but not for Republicans. The Democrats perceived that the ACA was under threat and rallied behind that issue. That helped propel them to large gains in the House. Altman predicts that with that new Democratic-majority some of the big moves proposed in the last two years will not happen. These include repeal and replace of the ACA, changing Medicaid to include caps or block grants, and changing Medicare to a voucher system. He further predicts that no major health legislation will be passed at all except perhaps some bipartisan legislation on drugs. As the 2020 presidential election heats up, Altman shows that healthcare will continue to be a big issue with Medicare-for-all perhaps out in front of the others. There are many misconceptions about this kind of plan including the costs and benefits of a single-payer system. When it comes to Medicaid, sweeping change proposed by the Republicans is unlikely. Polls show that it is generally more well-liked than some people acknowledge, almost as popular as other big programs like Medicare and Social Security, in part because it covers almost 75 million people. There are lurking issues such as work requirements but most Americas want to keep it as it is, affordable insurance for low income people. Women played a huge role in the 2018 midterms. Women voters flipped districts across the country, and female candidates won a record number of congressional seats. So, what does it mean for American politics as a whole moving forward? 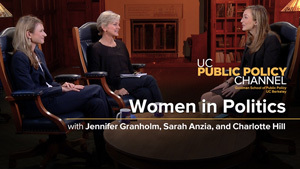 Former Michigan Governor Jennifer Granholm, and Goldman School of Public Policy professor Sarah Anzia sat down with graduate student Charlotte Hill to examine what happened in 2018, and what might happen in 2020. The conversation begins with an analysis of what led to the unprecedented wins of 2018. Both Anzia and Granholm point out there was a massive increase in women running as Democrats, but the number of Republican female candidates remained about the same as years past. Granholm argues the increase is evidence women are more motivated than ever before to get involved in politics, from the Women’s March to the voting booth. She suggests the lopsided nature of that motivation is in no small part a reaction to President Trump. The other major change the panel noticed was women changing the way they campaigned. From ads that show candidates breastfeeding, to addressing sexual assault, professor Anzia says, “women were running as women.” While it may seem like a strange observation, Granholm agrees, saying she was advised not to show her children, and was coached on keeping her voice low when she was running. Granholm calls the new acceptance of women being their authentic selves a gift. She points to millennial representatives like Alexandria Ocasio-Cortez as examples of women who have cast off restraints historically placed on women in office. As of now, there are four women officially running for president in 2020. Granholm believes a woman will certainly be on the presidential ticket. But, will we finally see a woman in the White House? Will 2020 be another historic year for women? Only time will tell, but Anzia and Granholm have some predictions. The results of the 2018 midterm elections are in, but what’s next? Will a Democratic-controlled House and Republican-led Senate be able to work together? What do the results mean for 2020? And, what should Democrats do to capitalize on midterm gains? Professor Emeritus Sanford A. Lakoff shared his thoughts on those questions and more at the Osher Lifelong Learning Institute at UC San Diego Extension. He begins by looking at midterm turnout, changing demographics, and increasing political polarization. He notes that many point to the Gingrich Revolution as the beginning of modern-day polarization, and suggests President Trump has only added to the trend. But, there is also division within the Democratic Party. Several newly-elected representatives have pledged not to vote for Nancy Pelosi for Speaker of the House. Lakoff argues that would be a mistake. He cautions that the coalition risks becoming a “Tea Party of the Left” if they are unwilling to compromise, especially without holding either the Senate or the Presidency. He suggests Pelosi should pledge to only serve as Speaker until 2020, and prepare new Democratic representatives to take on leadership positions in the future. Lakoff then lays out what he believes should be the top priorities for Democrats over the next two years. His list includes healthcare, immigration reform, climate change, and gun control. 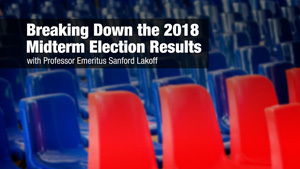 While he admits it’s unlikely Democrats will make significant progress on the issues, Lakoff says the effort would show voters what they can expect should Democrats take the Senate and White House in 2020. Lakoff also suggests lawmakers go beyond legislation, and set up think tanks and non-partisan commissions on the major issues of our time. Those include electoral reform, medical coverage, gun violence, the national debt, and ensuring employment with the development of artificial intelligence. But, the ability to make any progress on any of these issues may rest on an unpredictable variable: the Robert Mueller investigation.